I decided from the get-go to put Will Smith and the movie version out of my mind, which was easier than I had anticipated. There’s no room for comedy in the book. Written in 1954, I Am Legend reads like a contemporary novel, and doesn’t seem at all dated like I had feared. I finished it in a couple of hours; it’s very short, and of course, it left me wanting more. The story begins on a typical day in Robert Neville’s life. He’s getting the house prepared: eating, cooking, cleaning, making stakes and hanging garlic, waiting for night to fall and the vampires to arrive. They haven’t managed to get inside his house yet, but they come calling every night at sunset, shouting at him to come out. For all Neville knows, he may be the last man on earth, sharing the world with the vampires who haunt him nightly and the infected who are confined to their homes. When we first meet him, the practical day-to-day necessities are enough to keep his mind occupied and his body as healthy as possible, but he is just existing, not living. In an effort to keep his will to survive going, he decides to turn to science and try to find out what exactly happened to destroy the world, and perhaps find a cure or a weapon against the vampire disease. I’ve always been fascinated by the struggle to survive in a post-apocalyptic world and often wondered how I’d cope under such circumstances. Stephen King’s epic novel The Stand is my favourite book on this subject and it came as little surprise to read an afterword from him in I Am Legend. As to my original question: is it worth surviving the apocalypse? I’d have to say no, better to go out in the first wave than attempt to get by in a world without running water, electricity and a ready food and fuel supply. I like my modern conveniences 🙂 What do you think? 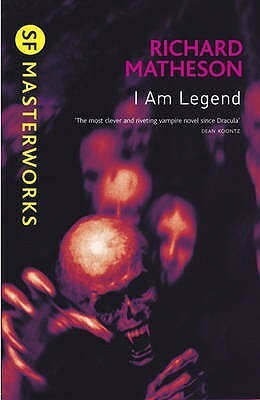 This entry was posted in Book Reviews and tagged book review, horror, i am legend, post apocalyptic, richard matheson, stephen king, vampires, zombies. Bookmark the permalink. See Michelle, you’re a born survivor. I don’t think I could cope in a zombie (thinking of The Walking Dead) or vampire infected world. But maybe you’re right, as long as I had some books for company and to educate me, I might be able to stick it out for awhile. I think I would try to survive the best I could. Things could always change for the better. But I’m an optimist at heart. They’re so gruesome in The Walking Dead, ugh. Thanks. I think I’m going to re-watch the film this weekend. I feel a bit dumb. I saw the movie and I thought the creatures were zombies, not vampires. Though now that I think about it, both are undead and infect humans. Hmmm. More things to ponder! In the movie they were portrayed as zombies. I was a bit taken aback myself when reading the book to find that the creatures were vampires. Roughing it in a distopian world isn’t for me, but with my luck I’d survive and fight for life. Thanks Jo-Ann. Let’s hope we’re never tested. Thanks for the review! I’ve seen the movie but have never read the book before. Sounds like it’s very different from the movie. Living in a dystopian or post-apocalyptic world would be scary. I agree with you… I’m not sure I would survive or if I would want to. I guess I’d just become a zombie. Lol! It is a bit different. I liked them both. Let’s hope we never have to live in a dystopian world!! OOohhh. Creepy. I remember watching the film (and not realising it was going to have evil vampire/zombies until I got in to the cinema) and thinking “I would just rather die.” Its an interesting concept definitely, but being the only alive person in the world? No thank you. Thanks you. That’s how I feel, better to go the same way as everyone else than to be all alone. I think I’d stick around. You never what could happen, anything is plausible. I think it would be neat to view the Earth from unusual conventions. Anyway, great post, I Am Legend is one of my favourite books. Awesome site by the way, I am now following. I recently started my own film blog and would love for you to check it out. Hopefully you’ll like what you see :). I adore post-apocalyptic fiction, but if it happened in real life, I don’t think I’d have the stomach to want to stick around. A world without electricity, running water, a ready supply of food, no protection etc does not appeal to me in the slightest.